In the last decades modern economics lost contact with reality. The latest statements from the ECB, OECD and IMF to fight the looming deflation in the Euro Zone being the latest prove. The economists have lost their sense of reality behind their indexes as it seems. We start our tale with the Consumer Goods Price Index telling only half the story about inflation in the EU. Compared to the small plus of 0.8% in the Euro Zone for all goods, the prices for vegetables, fruit's, cereals and electricity have risen more than tenfold. To make matters worse the food and electricity prices rise fast in the countries being hit hardest by austerity: Greece, Spain and Portugal! In the year 2011, accordingly to the Oxfam report „A Cautionary Tale - The true cost of austerity and inequality in Europe” (*1), more than 120 Million face poverty in Europe. To fulfil the prophecy the total public spending from 2010 to 2014 was cut by 40 percent of GDP in Ireland, approximately 20 percent in Baltic States, 12 percent in Spain and 11.5 percent in the UK. In reality this means cut's in health care, social welfare programs, education systems etc. worsening the living conditions of the low value human capital further – speaking in economic terms. Let us focus on Spain. After five years of stop-start recession they have an unemployment rate of 26-percent. Many Spaniards battle to pay their electricity bills, the third highest in the European Union. By the end of 2012, 17.9 percent of Spanish households - more than three million - were unable to adequately warm their homes, according to the National Statistics Institute. On it goes with the rise in child poverty and child malnutrition in Catalonia, Spain, since the economic crisis. Furthermore a decrease in calories purchased and substitution to unhealthier foods, especially in families with young children is happening. We can guess the same occurs in all countries with food and electricity prices rising. On the other side Portugal, Ireland, and Greece have slashed relative labour costs by 15% since 2009. Maybe they have thus achieved current account surpluses and are no longer “living beyond their means” like Draghi sad it so nicely, but they are also increasingly „living beyond their means to buy food and electricity“! Meanwhile the Spaniards are rebelling against the high electricity prices, which have soared by 42 percent since the economic crisis erupted in 2008 accordingly to AFP's Anna Cuenca. To understand the drama we look at the social equation: on the left side the countries are forced to cut labour cost's and government social spending, while inflation will be pushed on the right side leading to faster rising food and electricity prices. Here we have all the signs of an European wide public health emergency that is in danger of going unnoticed in the skyscrapers, until it is too late to take preventive action. If it comes to the point where the ECB will fight low inflation with another quantitative easing (QE) wave, we will see the next round of protests in Europe, but this time driven by food insecurity tearing Europe and the Euro apart. To understand the solution we have to take a look at the official fairytale of deflation which paints the darkest of all pictures for all of us. We are told that deflation means poverty and chaos. Nobody would buy something any more, all investments postponed into the future thus unemployment rocking sky high. But is this picture true? Let's test theory with reality, something modern economic science seems to avoid at all costs - lately getting worse! Japan is the place to go. Many years this country was plagued by deflation ranging from 0% to -1.5%. If economic theory is right, we should see the consequences in the unemployment graph. But if we compare both graphs with each other we see no correlation. Especially from 2004 till 2008 the unemployment rate in Japan was falling sharply while deflation went on till the economic crisis took over (During the whole time the low wage sector was growing, but this happened in all industrial countries). Further we saw that the Monetary-Policy of the Bank of Japan which tried everything had till the economic crisis in 2008 no real effect on deflation - besides cheap money for the banks (*2). let the Hunger Games begin Mr. Draghi! 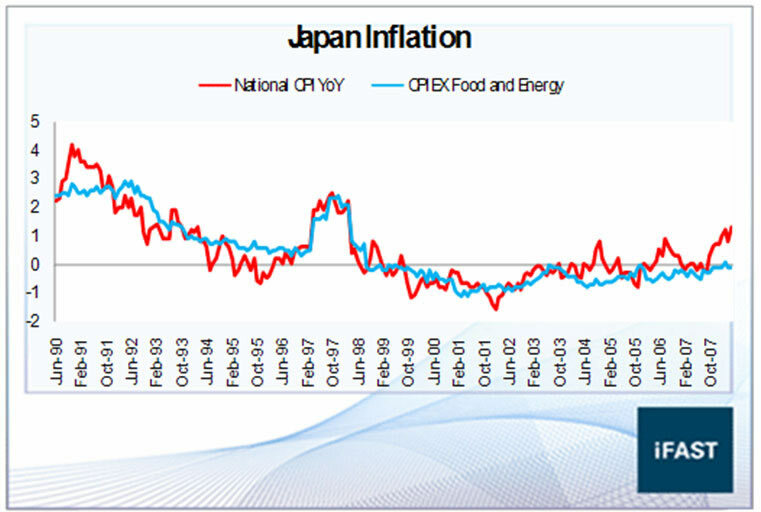 *2: Two decades of Japanese monetary policy and the deflation problem.